Possibly the Dumbest question of the day! The lever below the steering wheel to adjust the height has stuck solid. I've been the only driver for 15 years and I cant ever remember using it, so I guess it has just seized up? I've applied a reasonable amount of force, but before I break something, thought I would check whether its a smart idea just to keep increasing force? or should I be trying to get at the mechanism and apply some penetrating oil etc? You do actually mean the lever wont move down so you can then adjust it .. not that it does but the column wont move ? If its the lever then ive never actually seen this before .. i wouldn,t force it though .. i would be more inclined to remove the cover panels , have a look then plenty of lubrication and see if it will free off . EDIT .. added pictures ..
Lubricate it at 1 and 2 .. im hoping its more at no.1 that it has stuck . Plenty of spray , let it soak in then gently try and move the lever up and down . Yes I did mean the actual lever wont budge. Great Pics.. will get the WD40 out tomorrow and give a good soaking. The lever is plastic and feels like it would snap if forced too much. Will lube it up and keep wiggling until it moves. You can see the two positions without needing to remove any trim, so they have been soaked with wd40. The lever barely moves and is probably only the plastic flexing that gives any feel of movement. I need to have a look at one and see if there are any obvious places it might be stuck. Should have some in at work this week so ill report back . Mine did the same. Disconnect the battery and at the same time give the steering wheel a serious shove and pull thr lever down. After months of soaking and trying everything else it worked on my Boxster. Hi Blanc... thanks for your comments. Interesting solution... I didn't think the mechanism had any electrical connections? I thought it was just a lever on a cam that held the column in place by friction. I will give it a go as got nothing to lose... can you remember which direction you shoved the steering wheel? inwards/outwards/up/down... or all of them?! Its raining hard here at the mo... will give it a go when the weather eases. Was going to say it could be like when the bonnet and boot released lock up when the car hasn't been used much. Maybe just need to unlock car with fob, lock it again with fob and unlock again, then try the lever? Are you pulling/pushing on it in the right directions...? ....point being, if people have been yanking "up" and "down" on it for a long time..... even pulling it in the right direction is likely to be a little bit "fun"
Demon... yes I'm aware it moves in-out. My problem is I cant get the lever to move, so not getting to the stage where I am expecting the wheel to move yet. blanc seems to have had a similar problem so i've been trying his solution of disconnect battery and give it a few whacks while pulling lever, but no luck yet. 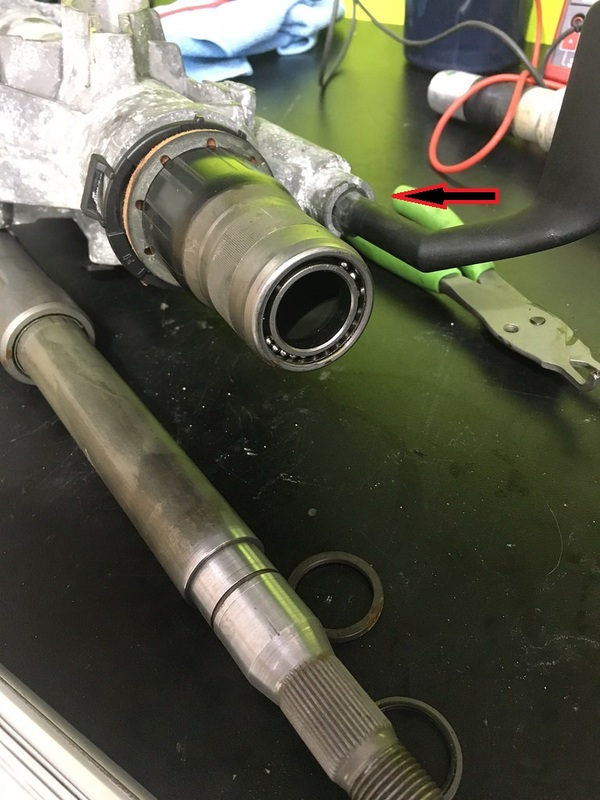 I can feel the shaft that runs under the steering column trying to twist when i pull the lever, but it barely moves even 1 degree so it must be stuck solid at the lower point No2 in the pics above. More spray, more wiggling and more whacking me thinks! Also will study wiring diagrams and see if there is any electrical interlocks etc. 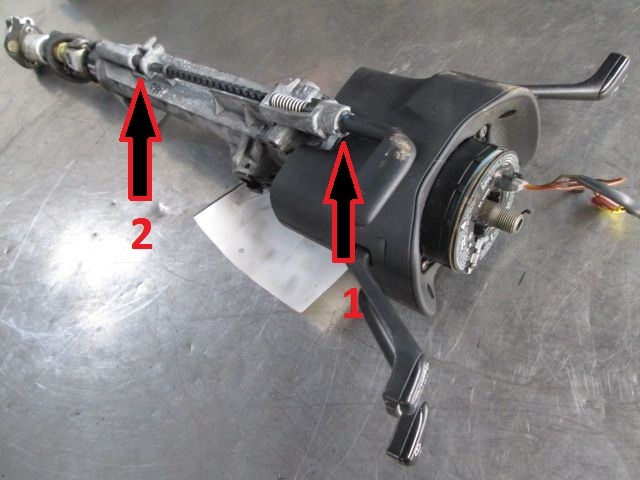 There is an electrical connection to the base of the steering adjustment lever. Nothing shows on the set of wiring diagrams i have (unfortunately they are the 996 1999-2001) which are prior to the Targa coming out so maybe something was added on the series 2's as a safety feature? Are your boot and bonnet releases working as normal? Yes.. no prob with boot/bonnet/rear window releases either on fob or on push buttons. 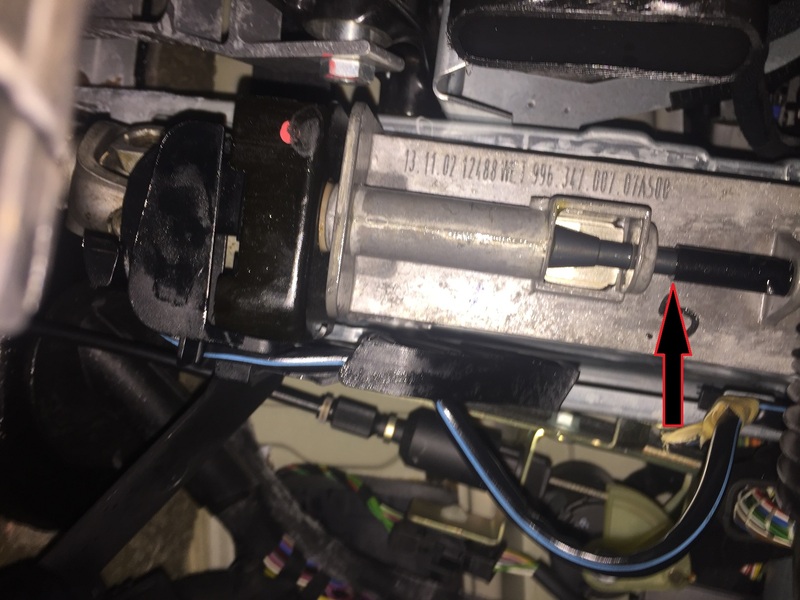 Are you saying there is an electrical latch for the steering adjustment lever that engages/disengages with the locking systems? There is no electrical anything for the steering adjustment .. the black box at the base of the column is the steering wheel angle sensor .. not fitted on a car with TC . remind me at the weekend for a wiring diagram for your car and ill sort it . Ok i had a look at a column .. the top part from the handle down is a seperate part to the base and unlocking mechanism. The handle and shaft twist and as they do the shaft moves downwards .. this then presses on the bottom shaft and moves it down .. it moves full travel about an inch . The join between the two is at the arrow .. i need you to look at this part then move the handle up and down and see if a gap appears .. it did on the one i looked at . If it does then even though its a tiny amount of movement it means the handle and shaft to that point are free to move . Without a strip down of the column then there not much you can do at that point . For the top section then keep spraying the joints at any section you can that houses the shaft . DeMort... thanks for looking into this further. Yes I can feel the top section moving a small amount at the point you have arrowed. The shaft below is stuck solid. Have just given it a few minutes of hammer tapping, but nothing happening. Obviously reluctant to hit it too hard. Do you think heat might help? I have a steam jet washer with a reasonably accurate nozzle that could be aimed at the metal housing. I dont think heat will help much by what ever method .. its internal and from what i saw when looking its a preened over cover on the top side to access the mechanism . This is one of those jobs you only tackle if you have a reason to do it as it may well end up with a new column being needed . Can you pm me the year of your car and an email addy to send it too .. or if you wish just the year and ill do an upload for you to download .